All aboard for an evening return journey on the Troop Train Friday April 26th. Bookings essential. Join us on our inaugural DeguSTATION Train. Thursday 8th August. 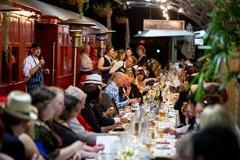 This special event train is a culinary journey through the stunning Mary Valley.